Citation: Bhardwaj H, Varma A (2019) Autoimmune Episodic Ataxia Associated with LGI1 Antibody in a Five Year Old Child. 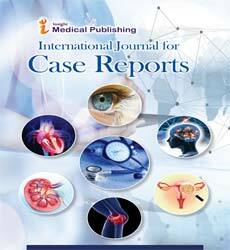 Int J Case Rep Vol 2:15. Copyright: © 2019 Bhardwaj H, et al. This is an open-access article distributed under the terms of the Creative Commons Attribution License, which permits unrestricted use, distribution, and reproduction in any medium, provided the original author and source are credited. LGI1 can also present as paraneoplastic disorders and is classically seen to be linked with thymoma [1-3]. Episodic ataxias (EAs) are a disease group of hereditary channelopathies with involvement of various channels ranging from potassium to sodium and calcium channels . The clinical features of such patients are usually the occurrence of paroxysmal episodes of cerebellar ataxia which can last from a time period of few minutes to hours depending upon the subtype of the EA. The episodes can be triggered by emotions, abrupt movements, exercise, or fever. Depending on which ion channel gene is mutated, additional symptoms, such as neuromyotonia or epilepsy, can also occur . However, such paroxysmal symptoms like ataxia are rarely seen in patients with surface anti neuronal antibodies associated neurologic disorders, and EAs have been reported rarely  in such a setting. 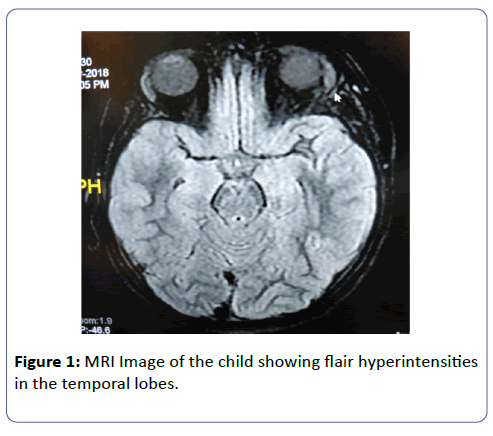 Here, we describe a rare case of a 5-year-old child who presented with predominant features of episodic ataxia along with some behavioral abnormalities who later came out to be LGI1 antibody positive. LGI1 associated limbic encephalitis is usually described in older men and classically presents with memory loss and faciobrachial seizures. However, our patient presents atypically both in the clinical presentation and also has an atypical age group for LGI1 associated encephalitis. Our patient is a 5-year-old girl without any previous co-morbidity. She was born out of a non-consanguine marriage and was a full term normal vaginal delivery. She was vaccinated adequately as per the WHO schedule and had normal milestones as per her age. She has been an interactive child with normal social interaction with the peers and parents. Two weeks before coming to us, she started to have difficulty in walking with a tendency to fall to either side. The episode was sub-acute in onset and progressed over a period of 3-4 days reaching its nadir. The total duration of the episode was 5 days. At the peak of the episode, the patient was unable to stand without support and also had swaying of the body while sitting quietly in the bed. However, after that the patient started to improve on her own and again became completely independent as before. After further 1-2 days she again started to have same symptoms as mentioned above and the patient was then brought to us. She was having abnormal behavior at that time in the form of increased irritability, anger and distractibility which was abnormal according to her usual nature. At the time of examination, her attention span was reduced. She was unwilling for her examination and crying excessively. However, once the mother made her relax, detailed neurological and systemic examination was done. Her systemic examination was normal. Neurologically, she had nystagmus with fast components towards the extremes of gaze. Her rest cranial nerve examination was normal. She had positive cerebellar examination findings in the form of bilateral intentional tremors, positive finger nose test and knee heel shin test. She also had positive past pointing and dysdiadokokinesia. Tandem gait was not possible for her and she had tendency to fall in either direction. She had ataxic type of speech. Tone in all the 4 limbs was normal and she had generalized hyper-reflexia. Power was normal in all the 4 limbs. Her left plantar had an extensor response and the right plantar was flexor. Sensory system examination was normal. The patient again started to improve after 1 day of the onset and she again became symptom free after 2 days. The duration of this episode was 3 days. However, after one day, she again had recurrence of symptoms with the similar findings as above. Her MRI of the brain was suggestive of bilateral medial temporal hyper intensities which were non contrast enhancing. MRI imaging of the spine was normal. Her CSF studies were done which had no cells with a protein of 22 and glucose of 67 with corresponding blood sugar of 90 (Figure 1). EEG was suggestive of spike and wave discharges from bilateral hemispheres from front-temporal region (right more than left) with phase reversal at T6 (Figure 2). Her vasculitic panel was done which was negative. On the basis of the above features of behavior abnormalities in the form of loss of attention, irritability, aggression and easy distractibility with episodic cerebellar features without any preceding fever or viral prodrome, she was thought to be a case of an acute presentation of an autoimmune disorder. Figure 1: MRI Image of the child showing flair hyperintensities in the temporal lobes. 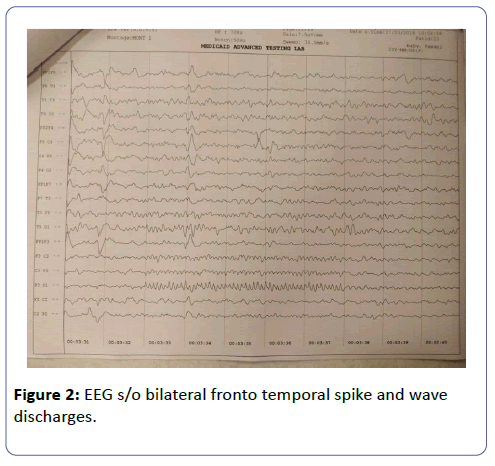 Figure 2: EEG s/o bilateral fronto temporal spike and wave discharges. Her CSF and Serum tested positive for LGI1 antibodies by indirect immunofluorescence assay. She was then started on infusion of Injection Methylprednisolone. She had dramatic improvements in her symptoms after 5 days of therapy of 500 mg infusion per day and was again playing happily and was running around in the ward. After the therapy, it has now been 2 months and she has not had any recurrence of the symptoms without being on any further immunomodulation. Her behavior has also improved and she has again become cheerful and interactive as before and cooperated completely during the examination. She presently has no cerebellar features and other neurological examination also remains to be normal. LGI1 associated encephalitis usually as well defined in the literature, presents in elderly men with memory changes and faciobrachial seizures however, atypical manifestations can be seen. Episodic ataxia is seen very rarely as the manifestation of LGI1 encephalitis and in few case reports , it has usually accompanied the usual presentation in the specified age group and has never been reported in pediatric population and that too as a presenting feature. As the features of cerebellar involvement developed as a presenting complaint accompanied by behavioral abnormalities and then resolved after immunomodulation therapy, we can speculate an immune origin of these paroxysmal ataxias. Paroxysmal neurologic symptoms have already been reported in some forms of auto-immune encephalitis like the occurrence of Faciobrachial dystonic seizures due to activation of the motor cortex in patients with LGI1 antibody-associated encephalitis . The resemblance of our patient presenting with episodic ataxia with manifestations observed in hereditary channelopathies such as EA is striking and could be explained by the presence of paroxysmal features in both the entities (EA and LGI1 limbic encephalitis) due to autoimmune ethology. Overall, our findings suggest that transient cerebellar ataxia should be added to the spectrum of LGI1 antibody-related symptoms and the spectrum can present in any age group ranging from pediatric population to elderly patients. Such episodic symptoms resembles the symptoms of hereditary channelopathies and suggests that ion channel dysfunction is involved in the pathogenesis of anti-LGI1antibody syndromes. Tüzün E, Dalmau J (2007) Limbic encephalitis and variants: classification, diagnosis and treatment. Neurologist 13: 261-271. Asztely F, Kumlien E (2012) The diagnosis and treatment of limbic encephalitis. Acta Neurol Scand 126: 365-375. Irani SR, Michell AW, Lang B, Pettingill P, Waters P, et al. (2011) Faciobrachial dystonic seizures precede Lgi1 antibody limbic encephalitis. Ann Neurol 69: 892-900. Tomlinson SE, Hanna MG, Kullmann DM, Tan SV, Burke D (2009) Clinical neurophysiology of the episodic ataxias: insights into ion channel dysfunction in vivo. Clin Neurophysiol 120: 1768-1776. D'Adamo MC, Hasan S, Guglielmi L, Servettini I, Cenciarini M, et al. (2015) New insights into the pathogenesis and therapeutics of episodic ataxia type 1. Front Cell Neurosci 9: 317. Joubert B, Gobert F, Thomas L, Saint-Martin M, Desestret V, et al. (2017) Autoimmune episodic ataxia in patients with anti-CASPR2 antibody-associated encephalitis. Neurol Neuroimmunol Neuroinflamm 4: e371. Balint B, Regula JU, Jarius S, Wildemann B (2013) Caspr2 antibodies in limbic encephalitis with cerebellar ataxia, dyskinesias and myoclonus. J Neurol Sci 327: 73-74. Navarro V, Kas A, Apartis E, Chami L, Rogemond V, et al. (2016) Motor cortex and hippocampus are the two main cortical targets in LGI1-antibody encephalitis. Brain 139: 1079-1093.